<br>We have two neighborhood cafes as well as a bakery. 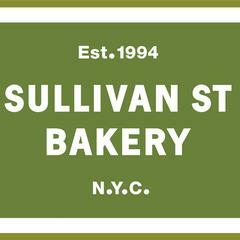 Inspired by Italian bakers and bakeries, Sullivan Street Bakery was founded in 1994 in New York City. In 2000, the bakery moved to Hell's Kitchen, where it remains today. Known for our bread, Roman-style pizzas, and pastries, Sullivan Street Bakery has been a New York staple for 20 years.